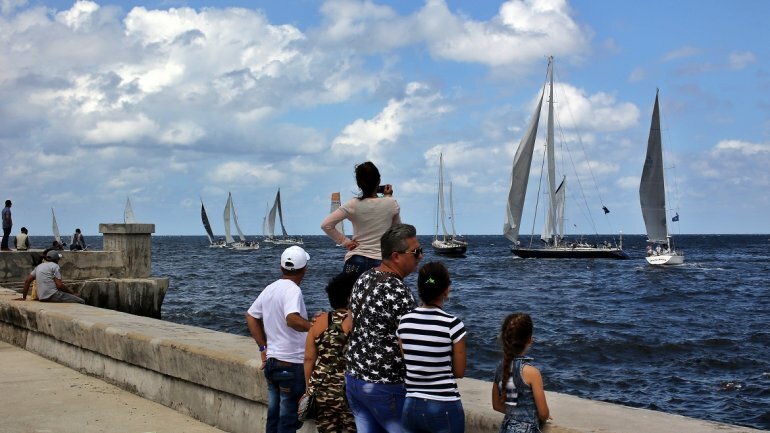 The Fresh Pineapple boat led this Wednesday the nautical regatta between the US city St. Petersburg and Havana 2019, being the first to dock at the docks of the Marina Internacional Hemingway resort, west of the Cuban capital. In this race that departed from the Bay of Tampa, in Florida, participate 25 American sailboats to which the Cuban “Mícara” joined, with a crew made up of members of the Club Hemingway of Havana, according to that institution of the island . During the next hours and until this Thursday the arrival of the rest of the boats, mostly with the United States flag, is expected. It is expected that next Saturday all boats present in this event will star in the 500th Anniversary Parade of Havana and will also participate in the Torreón de la Chorrera Regatta, which will take place on the coast of the capital of the Caribbean country. Navy Commodore Hemingway, José Miguel Díaz Escrich, explained in a press release that with the St. Petersburg-Havana regatta the program of nautical, academic, historical and educational activities is opened for the 500 years of the founding of San Cristóbal of Havana. The official regattas between the USA Cuba and Cuba stopped celebrating in 1959, the year of the triumph of the Revolution on the island, and it was precisely a sailing competition between the cities St. Petersburg and Havana -a circuit that began in 1930-, the last one carried out before the suspension. Since 2015, after the restoration of diplomatic relations between Cuba and the US, the Friendship Cup, Havana Challenge, Bone Island Race and Tampa-Havana, and Miami-La Habana regattas have been held again.